Justin Trudeau says he abandoned a proposed meeting with Donald Trump in Washington this week after the White House insisted that the prime minister first agree to a five-year "sunset clause" in a renegotiated NAFTA. Justin Trudeau says he abandoned a proposed meeting with Donald Trump in Washington this week after the White House insisted that the prime minister first agree to a five-year "sunset clause" in a renegotiated North American Free Trade Agreement. 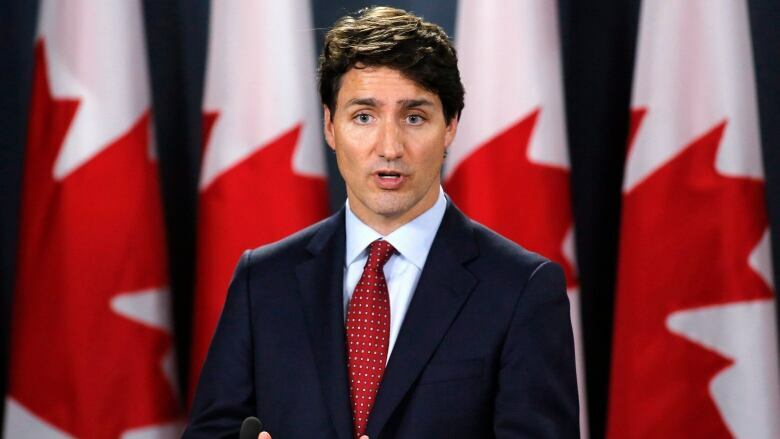 Trudeau told the anecdote Thursday during a media briefing where he and Foreign Affairs Minister Chrystia Freeland were outlining the Canadian response to punishing U.S. tariffs on steel and aluminum imports. With the NAFTA talks seeming close to a possible breakthrough, Trudeau says he suggested to the U.S. president last Friday that they sit down with Mexico's Enrique Pena Nieto and talk about reaching a deal. "I stated that I thought we were quite close to reaching an agreement, and perhaps the time had come for me to sit down with the president in Washington in order to finalize the NAFTA agreement," Trudeau said in French. "We already had the bones of a very good agreement for all parties, and I thought it might be opportune for all of us to sit down for a few hours and discuss it." Trump seemed to like the idea, Trudeau said. Then on Tuesday, Vice-President Mike Pence called to say the White House would host the meeting — but on one condition. "I had to agree to a sunset clause in NAFTA, which is to say every five years, NAFTA would come to an end unless the parties decided to renew it, which is completely unacceptable to us," he said. "So I answered that, unfortunately, if that was a precondition to our visit, I was unable to accept — and so we did not go to Washington for that day of negotiations." Commerce Secretary Wilbur Ross said Thursday that the decision to slap Canada and Mexico with stiff steel and aluminum tariffs was based on a lack of progress in the NAFTA talks. "Those talks are taking longer than we had hoped. There is no longer a very precise date when they may be concluded" so they were added to the tariff list, he said. Neither the tariffs nor a series of retaliatory measures imposed by the federal Liberal government in response will affect the ability to keep renegotiating NAFTA as a separate track, Ross added. "They're not mutually exclusive behaviours." Perrin Beatty, president of the Canadian Chamber of Commerce and a former Mulroney cabinet minister at the time of the original Canada-U.S. free trade deal, expressed surprise at the sunset-clause tactic. "That is not the basis on which mature adults negotiate," Beatty said. "For someone who prides himself as a negotiator, anybody who does business on the basis of, 'One side can only win if the other side loses' usually isn't in business for very long."